There is still time to get your submission in as part of the WRITE NOW! 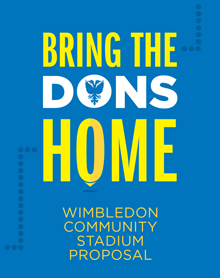 campaign in support of the Wimbledon community stadium application. So keep writing and please do everything you can to convince other sympathetic local residents to do the same. The club published a detailed update and explanation of their transport proposals yesterday. “One of the most important issues relating to the new stadium is about how we get supporters to and from the venue efficiently on match days. Our consultants have carried out a large amount of work on this by liaising with Transport for London and the boroughs of Merton and Wandsworth during the last two years. “Although there are still some issues to be resolved, we are satisfied that the work has demonstrated we can deal efficiently with the number of supporters needing to use public transport and issues to do with parking. Furthermore, based on our research, TfL have confirmed that underground services are likely to be able to accommodate the anticipated demand while Network Rail has confirmed that they have no objection to the development. If you live near the stadium or if local people you talk to want to know more about the proposals, you may also be interested to know that the London Boroughs of Merton and Wandsworth have arranged public forum meetings for local residents and businesses. These meetings will provide an opportunity for the project team to explain the proposals and answer questions regarding the planning application. Where: Drama Hall, Burntwood School, Burntwood Lane, SW17 0AQ. Where: Main Hall, Ricards Lodge High School, Lake Road, SW19 7HB.